Level of Care. Each person has different needs, even when recovering from the same injury/illness. Perhaps your loved-one requires round-the-clock care, or they’re looking for occasional assistance [link to assisted living description] in an otherwise independent lifestyle. 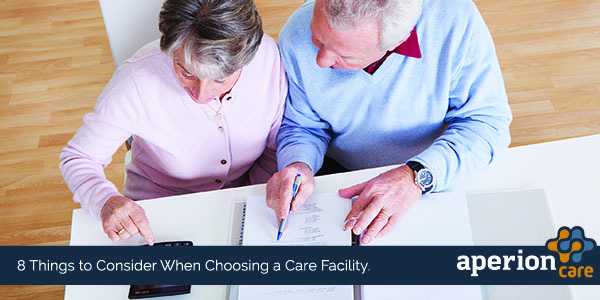 Knowing the level of care you are seeking will help you narrow down the best facility for your needs. Accommodations. The number one goal is to get back home. However, while you are recovering, you will want to feel clean, safe, and comfortable in the facility that you chose. Additionally, you should consider the extra amenities that some facilities offer like entertainment, beauty salons, even movie theaters. Methodology. Find out what kinds of innovative recovery strategies, therapy equipment, specialized training and programs each facility offers. A great facility will take your care beyond the basics of recovery. Credentials. Look into the Medicare ratings for each facility. Find out if the facility has any accreditations like the Joint Commission certification. This could also be as simple as looking for testimonials from current and former residents and family members. Proximity. A basic factor is how close the facility is to your home. Choosing a nearby location will make it easier for family and friends to visit often. Continuing Care. What does the facility offer after you are discharged home? Ask about their social services staff. Will they help you make the transition back to your house? What about community exercise or meditation classes? Do they offer programs to help you continue your healing journey after you go home? Referral. When you are released from the hospital, you should be consulting with a referring staff member from the hospital. This person can do a great deal of the legwork for your search. Listen to their facility recommendations; they send patients into rehabilitation daily. Lastly, there is no other substitute for seeing the place in person. Visit the facility. Photos don’t give you a good feel for the space. Plan a visit to the facility and talk to staff members, administrators, and other residents. The best indicator of a facility and the quality of care they provide is to view first hand how the staff and guests interact. There are special considerations to take into account when choosing a facility for Alzheimer’s care or long-term care. Schedule a tour at your local Aperion Care facility today.